In olden days, Talas were classified as Marga and Desi. Ancient texts mention 5 Marga and 120 Desi talas. There are references to other classifications like the 108 Talas, (which incidentally includes the longest tala, Simhanandana of 128 Aksharas or counts mentioned earlier), 72 Talas (based on the 72-melakartas) and Navasandhi (Nine) Talas. These classifications are however almost obsolete today and are mainly confined to demonstrations. However, the Suladi Sapta (Seven) talas (referred to as just Sapta tala for the sake of convenience) are the principal talas in vogue today. They represent a convenient and workable selection from out of the numerous mentioned in various texts. Before we go into the 175-talas, it is imperative that we introduce another new concept called "Gati". Gati refers to a specific but fixed time-interval between any two beats within a tala. 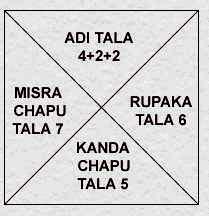 It can again be of five types: Chaturasra, Tisra, Misra, Khanda and Sankeerna. The important thing to remember here is that the common names for the types of Jaati and Gati are only indicators of the values 4, 3, 7, 5 and 9. Whereas Jaati refers to the external finger-counting, Gati refers to the internal count between beats in the tala-cycle. Jaati gives a structure to the tala and Gati determines the gait of the tala. Coming to the 175 talas, it's once again a simple extension of the 7 and 35-tala concepts. Let's use the same example given above, Dhruva tala. Now we already know that it can be of five different jatis. Suppose we specify the Jaati as Chaturasra, let's see how the gati can affect it. We know that the Chaturasra Jaati Dhruva tala has an external count of 14. However, while rendering the tala, how are we to ensure that the time-interval between each beat is uniform? This is where we introduce Gati. Now, we could have a fixed interval of 4, 3, 7, 5 or 9 counts between each beat. Let's take the example of Chaturasra Jaati dhruva tala with an interval of 4 units per beat, i.e. Chaturasra gati. The external count of 14 is multiplied by 4 (gati units) and we get a total of 56 internal counts for the tala. The same would change to 42 in Tisra Gati (14*3). In other words, each of the 35 talas can be rendered in any of the 5 different gatis. Thus the 35-talas become 175 (35*5). These are a special set of talas used in a special variety of compositions called Tiruppugazh. The uniqueness of this tala lies in the fact that it varies according to the stress and rhyme-patterns (called Chanda) in the Tiruppugazh. In a Carnatic concert we commonly find four talas - Adi, Roopaka, Misra Chapu and Khanda Chapu. The ratios in which the numbers of compositions are set to these talas are also in the same order. However in a concert all these talas have to be used to give a rhythmic variety to the concert. The other means of bringing out a rhythmic variety would be to use songs composed in different tempos or speeds. In other words, Adi tala has several compositions, each in a different tempo and gait. These could be effectively used to bring out contrast within the concert. Variety can also be brought out by singing compositions with different starting points. For example, a composition can start at the very first beat of the tala. Or it can start at the next beat or after a few counts within the beats. The starting point is known as eduppu or graha. Questions or comments? Send us E-mail.